Author Heather Ostler is guest blogging today at Fire and Ice about Sirens as part of The Siren’s Secret official blog tour! Sirens are enchanting and mysterious creatures. In mythology they are believed to be beautiful woman who can lure men to their deaths. Though they are supernatural creatures who live in water like mermaids, they have legs, not fins. Powerful and manipulative, sirens have always been seen as a threat. They are extremely smart, and can see into your past and the future from only meeting you. Sirens are able to lure and hypnotize sailors using their lovely, sweet singing voices. Often in mythology sirens would find unsuspecting sailors and hypnotize them. Once the sailors were lured in from their singing, the sirens would capture them, or make them crash their boats into rocks. The siren’s song was different for each sailor, but always too beautiful to resist. Unfortunately for the many sailors, the end of the siren’s song was death. Sirens are usually portrayed as femme fatals. They are known as being vicious and deadly. They can use either their beauty to charm and entrance their victim, or they can use their hypnotizing abilities to get what they desire. Mythology always portrays sirens always living on islands surrounded by cliffs and rocks, and Roman writers always linked sirens closely to the sea. Sirens are also featured in Homer’s Odyssey, and are known as the Muses of the lower world. Book Summary from Goodreads: Julia’s life has gone from complicated to nearly impossible! When Julia loses her shapeshifting powers and her appearance changes in alarming ways, she flees to Sirenity, where she learns an incredible secret about her mother. In this thrilling sequel, Julia must take greater risks and make bigger sacrifices as she discovers who she really is and what she can really become. Early Breview: Sirens entrance me. I’ve always been fascinated by the creatures who live in the sea. When I saw this cover on Netgalley I was lured and captivated. 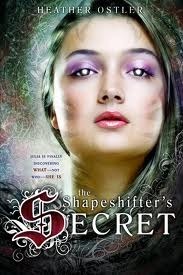 I hadn’t read book one of the Shapeshifter’s Secret (we review it here) but was easily able to pick up where it left off as Heather gives a plot retelling in the first few chapters of book two. Julia is in hiding in an antique cottage with her father and the guard after an attempt on her life. Her life seems ever more complicated as the tension heats up between her boyfriend Terrance and friend, protector Caleb. When a date with Terrance goes dangerously wrong and Julia is intercepted by a mysterious Siren there are questions to be answered. With enchanting mythology and a magical setting, Heather Ostler paints her unique spin on shape shifters and the difference between water nymphs and sirens. I wish I could fully immerse myself in the Lockham academy and underwater scenes of Sirenity. I found myself wanting much more filling out of details and world building. With little inventions like a parchment that writes and receives messages and a truth telling ring there is plenty of room for lots more imagination. I also am pulling for one side of the love triangle to move ahead. I’m hoping book three picks up the pace in swoon worthiness and character development because a huge whopper of a plot twist has been dropped. Content: The Siren’s Secret is a clean read suited for middle grade and young adult readers and I am happy to recommend it to all. Mild violence. 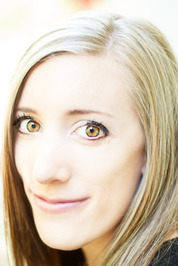 About the author: Heather Ostler grew up near the mountains with a rambunctiously entertaining family. She majored in English at Utah Valley University, and soon began composing stories about masquerades, water nymphs, and shapeshifters. She and her husband, Kellen, reside in Highland, Utah with two remarkably pleasant pugs. 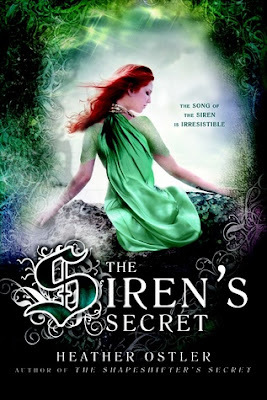 The Giveaway: We have one ebook copy of The Siren’s Secret to giveaway to our readers! Open internationally, simply fill out the rafflecopter form to enter. Good luck and thanks so much to Heather Ostler for visiting Fire and Ice today. Summary from Goodreads: Julia is finally discovering what–not who–she is. Like any sixteen-year-old, Julia’s used to dealing with problems. From her overprotective father to her absent mother to a teacher who definitely has it in for her. But everything changes when Julia’s reactions become oddly vicious and angry—more animal than human. This action-packed adventure has it all: humor, romance, and a plot that will keep you guessing to the very last page. Cathy’s Review: Julia’s a normal 16 year old girl, or so she thinks. Her dad is really overprotective and that makes her do crazy things like sneaking out of her window at night to go to her friend’s parties. That all changes when the new boy at school hears that she’s been sneaking out. Julia thinks that he told her dad, because right away her dad installs bars on the windows of her room. Julia gets so angry at her dad, and then she feels really weird, but she’s uncertain why and her dad doesn’t seem to want to explain anything to Julia. He also doesn’t want to tell her about her mom that she’s never known, so it’s all a big surprise to Julia when she learns that she’s basically royalty from another dimension, where she’s being hunted by a group called the Guild. To escape them she must learn how to defend herself as well as how to control her Shapeshifting into a werecat. This book was amazing! I loved Julia and I really loved the premise behind this story. What girl doesn’t want to figure out that they really are a princess that they all have dreamed about being as a little girl. The plot was fast moving and I really enjoyed the adventure. I liked that I was unable to guess which way the plot was going to go. I did kind of wish that Julia would choose the other guy, but maybe in a second book!